As a big fan of all things snooker myself, and that Saturday evening delight, Big Break back in the UK television day, I absolutely loved the idea behind this slot game. With bonus features, including plenty of free spins, it delivered on my expectations. Shoot yourself some snooker now and see if the reels are paying out for you today! 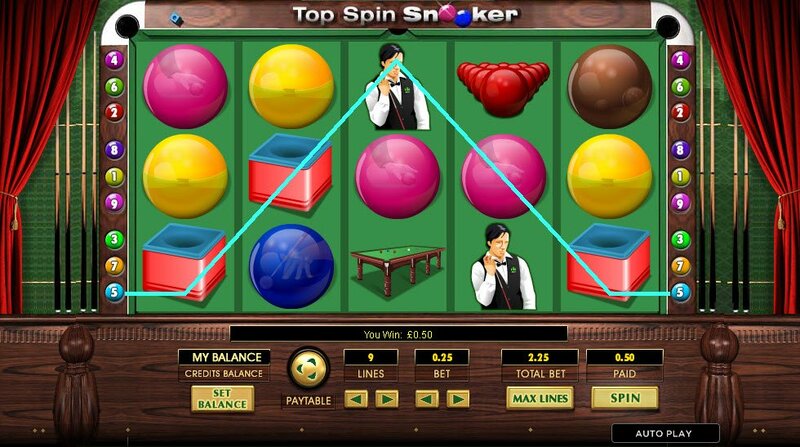 Some seriously cool blues style jazz music accompanies the Top Spin Snooker slot game. As the wheels spin, we hear the twangs and get drawn in to the chilled out and too cool for school atmosphere this slot instils in us. I just couldn't not stop spinning the wheels, wagering on how many of the 5-reeled 9 payout lines would win me the top spin prize. Whenever I won a line, the music deepened and uplifted me even further than the growing amount of coins in my balance. There was even an after residual burst of fanfare to acknowledge my feat even further after a win. There's the table, the ubiquitous host with black waist-jacket, blue chalk, the set-up of balls to break with the cue, unscrewed and in its special box. Then we have the range of different coloured snooker balls, each worth a different amount like in real life in the game. 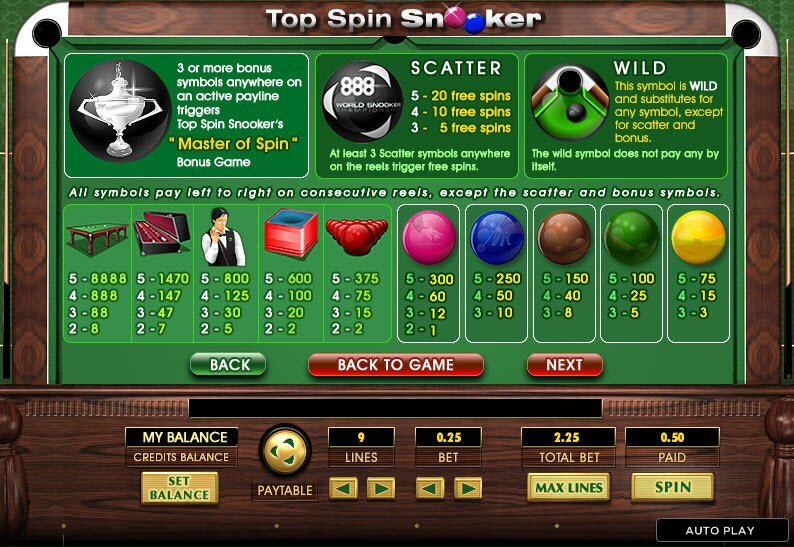 Spin yourself into a frenzy of wild and scattered balls with the 888 World Snooker scatter symbol and clip of the black ball about to enter the pocket wild symbol. 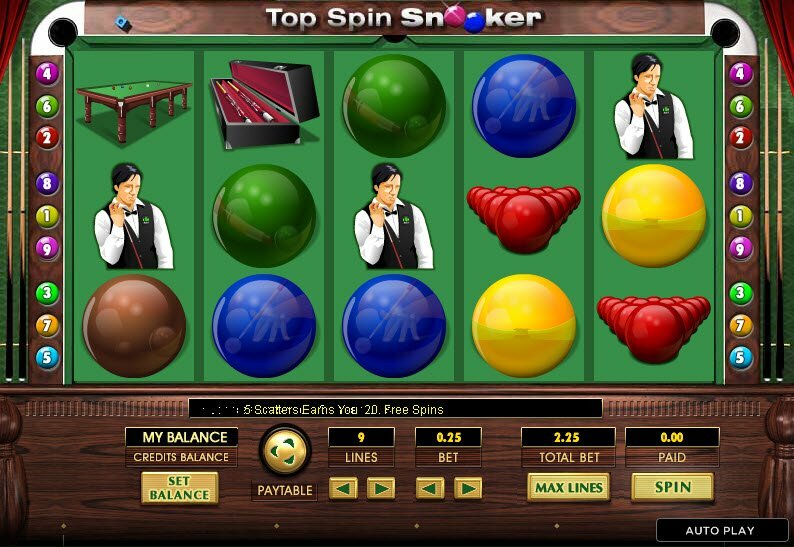 You'll either scatter free spins all over the place, or substitute for any other symbols and increase your Top Spin Snooker slot jackpot chances. The shining trophy, encased in the black ball is our Top Spin Snooker Slot bonus symbol and will enter you into the Masters of Spin bonus game, where you will work your way through seven gruelling rounds, avoiding getting the white ball in the pocket and mastering the correct ball at each level, for the biggest coin prizes available.